(August 6, 2016) On July 21, the Federal Aviation Administration (FAA) implemented Phase 3 of their plan to disperse noise created by airplanes arriving at and departing from Charlotte Douglas Airport. Since the airport is located at the north edge of Steele Creek, our community is significantly affected by airplane noise. The map below shows dispersed departure paths towards the southwest resulting from Phase 1, which was implemented on October 15, 2015. The dispersed departure paths to the southeast were the result of Phase 2, which was implemented on May 31, 2016. The purple shading shows the projected dispersed path area for flights departing more directly south that were expected after Phase 3 implementation on July 21, 2016. These patterns reflect departures during south flow airport operations. The changes also affected south flow arrivals as well as arrivals and departures when the airport is in north flow operations. The flow changes so that airplanes are taking off and landing into the wind as much as possible. 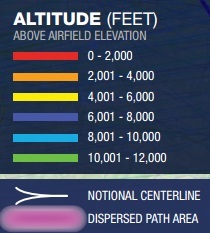 The airport is on a north flow 55% of the time and on a south flow 45% of the time. Further information is available on the Charlotte Metroplex Public Engagement web site. On that page are links to the Charlotte Metroplex Phase 3 Update presentation given at the public engagement session on July 13 and the Phase 3 Radar Tracks maps. Also see FAA dispersing Charlotte Douglas departures to scatter jet noise in the Charlotte Observer July 14, 2016. As the Observer reported, "The older, more narrow flight path sent flight directly south before turning west, almost directly over the Yorkshire neighborhood off of South Tryon Street. Under the new plan, many flights will make their turn to the west sooner, around the time the planes cross Interstate 485."